Ascertaining the identities of candidates is critical for fair conduct of recruitment process and prevention of impersonation. The provisions of Aadhaar (Targeted Delivery of Financial and Other Subsidies, Benefits and Services) Act, 2016 (the Aadhaar Act 2016) and the Regulations under the Act have come into effect on various dates as published in the Official Gazette. 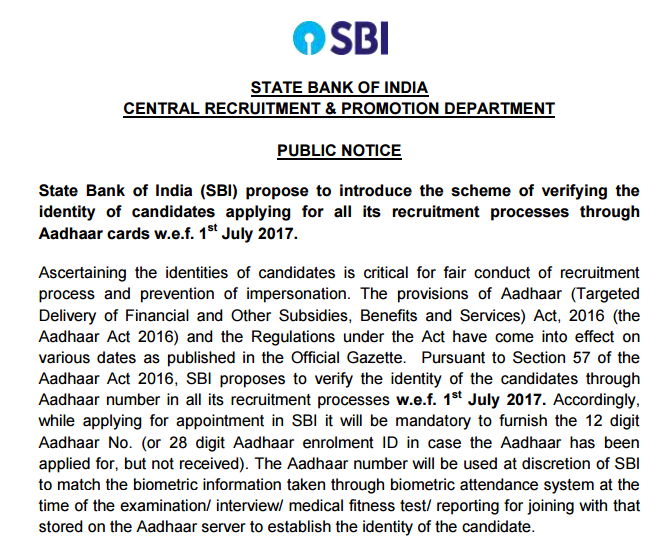 Pursuant to Section 57 of the Aadhaar Act 2016, SBI proposes to verify the identity of the candidates through Aadhaar number in all its recruitment processes w.e.f. 1st July 2017. Accordingly, while applying for appointment in SBI it will be mandatory to furnish the 12 digit Aadhaar No. (or 28 digit Aadhaar enrolment ID in case the Aadhaar has been applied for, but not received). 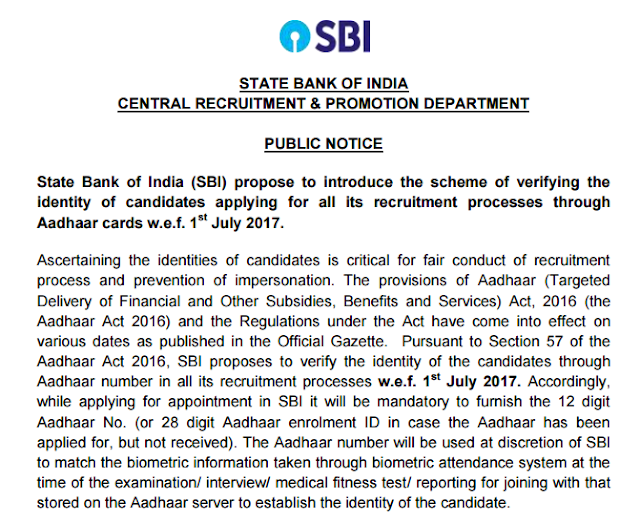 The Aadhaar number will be used at discretion of SBI to match the biometric information taken through biometric attendance system at the time of the examination/ interview/ medical fitness test/ reporting for joining with that stored on the Aadhaar server to establish the identity of the candidate. The above provision is applicable in all States and Union Territories of India except the States of Jammu & Kashmir, Meghalaya and Assam. Applicants from these States may use voter ID, passport, driving license or any other valid document, as may be specified by SBI in the relevant recruitment notice, as proof of identity for future recruitments in SBI.